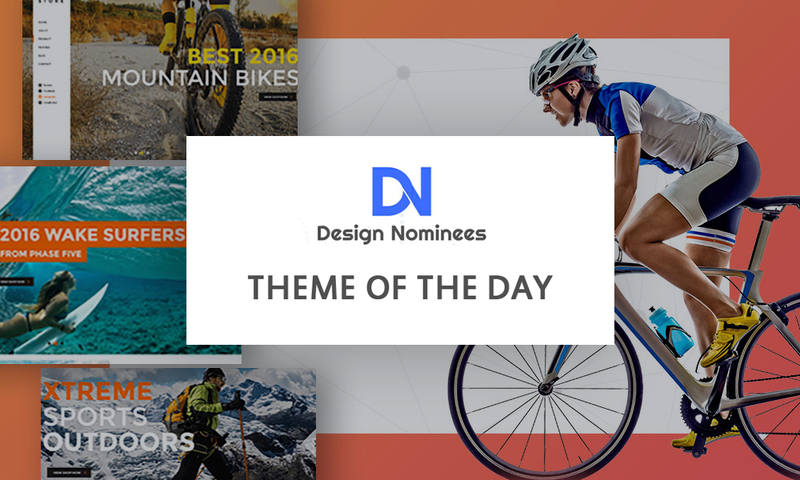 It is the fact that there are a mountain of WordPress environment themes in the theme market. Therefore, the work of searching for WP environment themes is tiring and tiresome. On the top of that, it is time-consuming, which means that money is deprived out of your pocket. In sympathy with your concern, I searched, explored and then synthesized 7 latest best WordPress Environment themes to date. The list of those 7 environment themes and their live demos are presented herein this article. Let’s check each theme’s description and live demo below for details before making your last decision of purchase. These environment themes are designed to specially serve Environment Protection companies, Biological and Ecology related projects, Environmental non-profit organizations or animal and nature protection agencies, as well as for eco fundraisers. With these WP environment themes, you will have a chance to create websites focused on ecosystems, recycling, alternative energy, organic agriculture or nature resources organization. 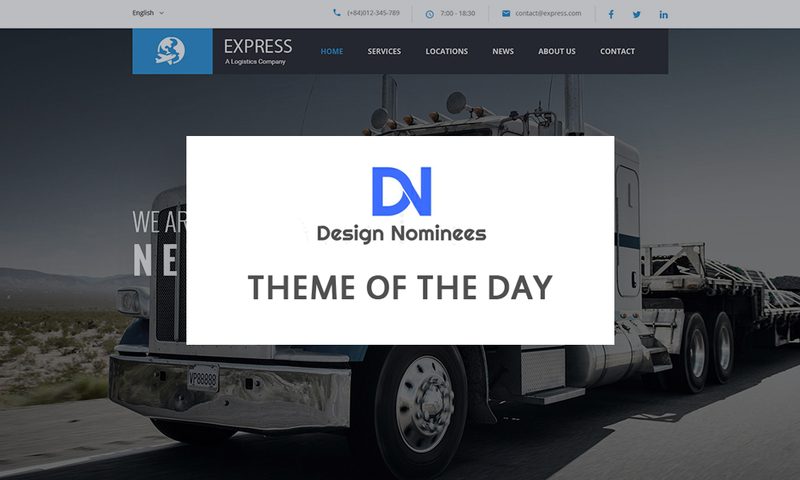 Each theme is packed with a distinctive collection of numerous theme features but shares similarities in Simple & Clean Look, Fully Responsive & Retina Ready, WordPress 4+, Compatible with Various Cross Browsers, Powerful Framework and many Built-in Plugins Included. 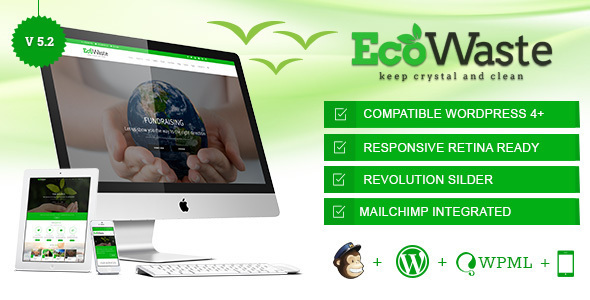 EcoWaste is integrated with Crowd Funding, CSS3 Animations, Awesome Drag&Drop Express Pagebuilder, Premium Revolution Slider, Ajax Contact Form 7, Social Media Posts and WooCommerce. EcoWaste is packed with Powerful Admin Panel, Page&Post Options, Advanced Header Options and Unlimited Color Schemes & Sidebars, Advanced Footer/Blog/Portfolio/Typography/Staff/Member Options, 10000+ Font Icons and 18 PSDs Files. Check EcoWaste’s Live Demo for more details. 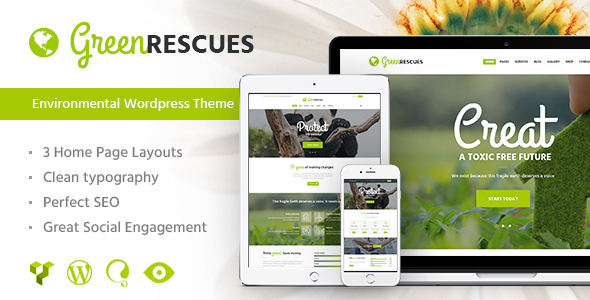 Green Rescues is integrated with Revolution Slider & Swiper Slider, Essential Grid, Visual Composer and PO Composer, Media Content Manager, Donations Plugin and WPML Plugin. Green Rescues comes with One-Click Demo Installer, Mobile Device Optimization, 3 Homepage Layouts, SEO Optimization, Multi-Functional User Panel, Awesome Hover Effects. Besides, the environment theme is packed with various Navigation options, Powerful Framework, diverse Custom Widgets and Custom Shortcodes and much more other features. Check the theme’s Live Demo for more details. 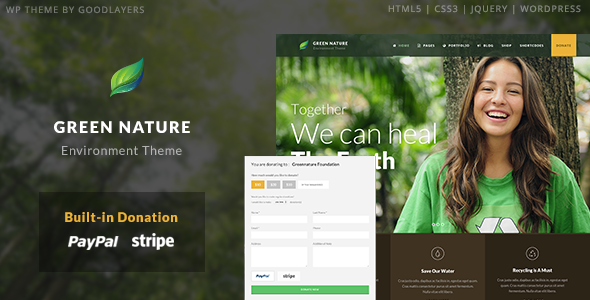 Green Nature is integrated with Paypal & Stripe donation system, WooCommerce, WPML Plugin and Master Slider. Green Nature is packed with 4 Blog Styles, 6 Port Styles GoodLayers Page Builder, One-Click Demo Installer, Advanced Admin Panel, Parallax/Color Section and Landing Page Template. 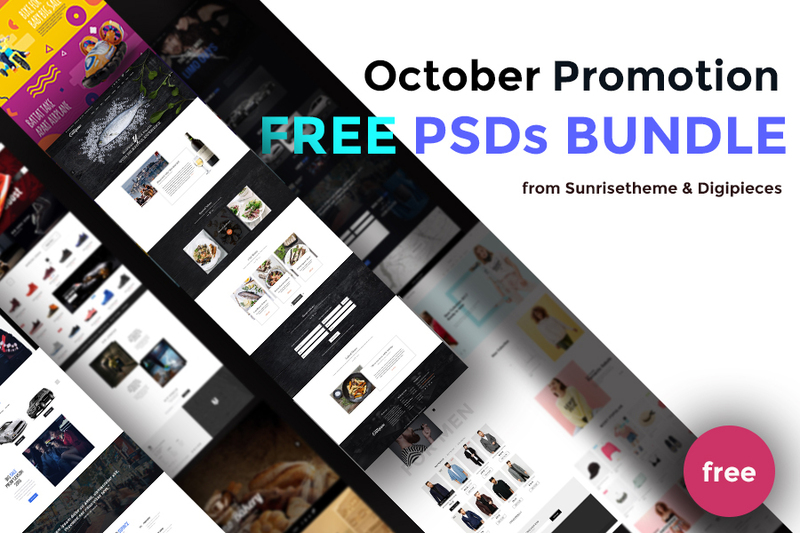 In addition, the theme has Awesome Shortcodes, Scalable Container, Floating Navigation, Mega Menu, Google Fonts & Font Awesome, Unlimited Sidebars, Theme Customizer and etc. Check this environment theme’s Live Demo for more details. 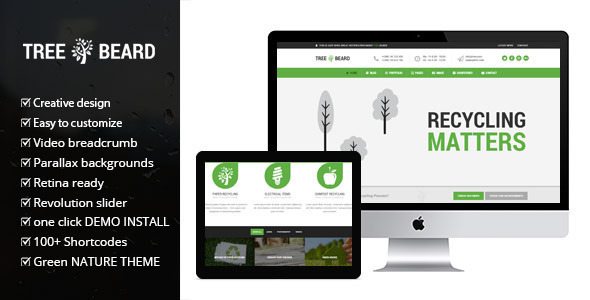 TreeBeard comes with a bundle of built-in plugins, namely Revolution Slider, WPML Plugin and CSS3 Animations. TreeBeard is packed with One Click Demo Installer, Page Builder, Parallax Backgrounds, 100+ Shortcodes and Font Awesome Icons. 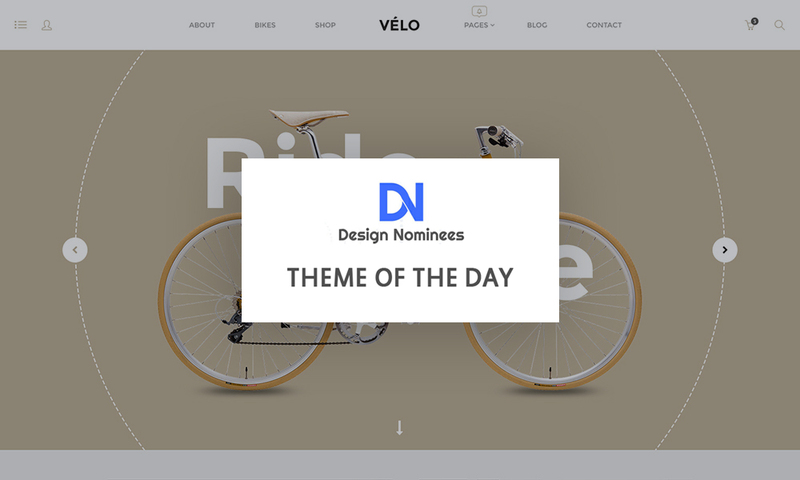 It is great that the theme offers 20+ Different Portfolio Pages, 10+ Different Blog Variations, 5 Post Templates, Mega Menu, Video Breadcrumb, Unlimited Homepage Templates, and much more. 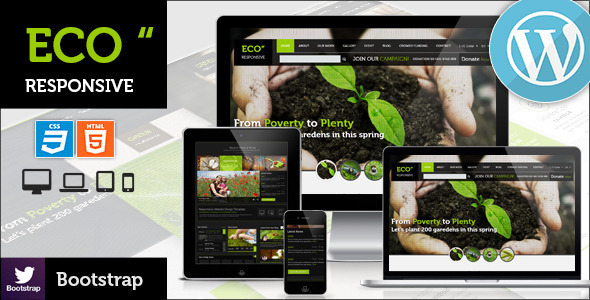 Check this ecology WordPress theme’s Live Demo for further details. 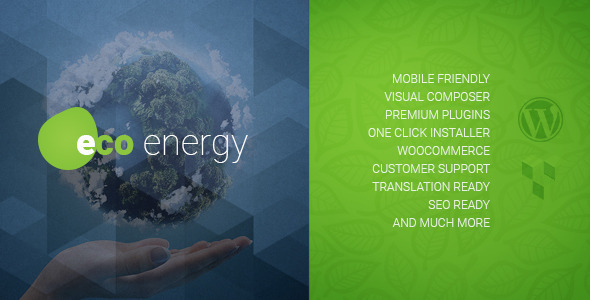 ECO Energy is integrated with Visual Composer, WooCommerce, SEO Optimized, Translation Options & WPML Plugin, Media Content Manager and PO Composer. 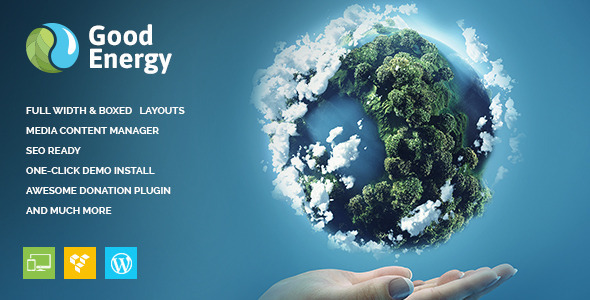 ECO Energy is packed with One Click Demo Installer, Mobile Device Optimization, Custom Theme Options Panel, Interactive Ajax Search Mechanism, 2 variants of Icon Display, Powerful Framework, various Layout Features, Slider Options, Navigation Options and diverse Custom Widgets & Shortcodes, etc. Good Energy is integrated with Media Content Manager, Awesome Donation Plugin, SEO Optimization, Visual Composer, Essential Grid Plugin, ThemeREX PO Composer and Event Calendar. Good Energy comes with One Click Demo Installer, Interactive Ajax Search mechanism, Two variants of icon display, Google web fonts, Performance Optimization, Powerful Framework and a lot of shortcodes, various Custom Widgets, diverse Slider/ Navigation Options and so on. ECO is integrated with WooCommerce, Layer Slider, WPML Plugin, Drag&Drop Page Builder, Drag&Drop Slider Manager and SEO Optimization. ECO is packed with Event Management, Crowdfunding using IgnitionDeck, Unlimited Colors, Multiple Blog Layouts, Testimonials, Team Page, Timeline, 450+ Google Fonts, Shortcodes, Logo/Font Uploader, Background Manager Social Share for Posts and Thumbnail Options, and much more. Skim through ECO’s Live Demo for details. These 7 best new WordPress environment themes are the best diamonds in diamond reserves. For their bundle of excellent features and stunning contemporary appearance, they never disappoint you. If it is still a daunting task for you to choose one out of 7 environment themes, I personally recommend that you should buy EcoWaste for its being offered at the lowest price yet owning undeniably stunning features. Top Favorable WordPress Non-profit Themes.